Wrigley is the sweetest puppy ever! While waiting for our house to be built, we stayed with my parents at their home. Wrigley was very spoiled as they are both retired and were home during the day almost always! They also live on a golf course that was a great place for Wrigley to run and play during the winter months with lots of geese to chase! I just wanted to tell you that Wrigley is the SWEETEST puppy I have ever met. There is something to be said about the temperaments of the puppies that you raise. My parents LOVED having her around because she was just so sweet, cuddly, and just a pleasure to be around. This is so helpful for times when Ryan and I might need to go away as they (along with my sister) are begging to take care of Wrigley! We are just overjoyed everyday that we have this incredible puppy with such an amazing personality, it has just been such a joy to watch her grow! She is such a dream with the other dogs at the dog park. Always happy and never aggressive. So she goes to a daycare in Nanaimo every week or so and absolutely loves it! Last Monday when I picked her up the girls told me she had been playing for 3 hours with this dog Molly. They told me that Molly is a middle aged and smaller dog and she usually isn't very social. When she comes in she just sticks to herself and her ball. They had only ever seen her socialize with one dog in all her time there. Until Scout. Scout and her played for 3 hours straight!! This was such a big deal that all the staff at the little/puppy daycare and the big dog daycare all came to see. They showed me the video and it was adorable. To top it all off, when i picked up Scout on Wednesday, they told me they had been playing again! The girls showed Molly's Dad the video of them playing, and apparently he was almost in tears. He had been sending her there to socialize but she always stuck to herself, but the fact that she was playing, and twice, and for so long with Scout made him emotional and so happy. She's made me proud, and I think this speaks loudly to her upbringing. Since I brought her home I've had no problem introducing her to new things, people, and dogs and she's always great with knowing how to approach everyone differently. I've seen her understand when to gently approach an older sick (partially paralyzed) dog and she knew to stay gentle their whole interaction, compared to knowing when it's okay to play with other younger dogs. I think this is what has made her able to interact with Molly so successfully. I just wanted to let you know this. Scout is an incredible girl who has the biggest heart, and I believe this has a lot to do with puppy culture and the socialization it encourages from the start. By bringing home a puppy who is already so adaptable and open to life has been amazing! So, thank you!! Kristina with Scout, formerly Biscotti. My husband and I dreamed of having a dog together for years, it was what comforted us in our time apart due to him being active duty American military. We always knew we wanted to raise a pup together but never really knew what type of breed. I have always loved retrievers but wanted something a little more unique than a lab or a golden. Through some research we found the Duck Toller. At first I didn't think it was even a real breed due to how unfamiliar I was to them. Through more and more research, we fell in love. They had all the qualities we were looking for in a dog: athletic, intelligent, and unmistakably beautiful. Then came the hard part, finding a breeder that we could trust. There were only a handful (I found) in the states and everyone I had talked to didn't give me that genuine feeling that they actually cared. It seemed more of a business transaction. I found Daintree during my research and loved how invested she was in her dogs. It's not as common as you would hope it to be. I found myself constantly comparing the breeders in the US to her and eventually just decided to contact her and see if getting a puppy out of the country was even possible. She was very informative about how the process would go and didn't sugar coat anything to get my business. October of 2015 we came to the decision that going with Daintree was a no brainer and we started our process into the application. Unfortunately my husband got sent on a temporary deployment and we had to put the process on hold. I kept in contact with Trisha and we discussed all the questions I had. We decided a summertime puppy would be best so we could both be around to raise it. The application process is thorough which made us trust her even more with how adamant she was to make sure her puppies are going to a great home. After we were accepted she kept us constantly in the loop on who the mother and father would be as well as the puppies' development after they were born. We never felt like we weren't a part of our puppy's life even though we lived in a completely different country. There was a constant feeling of connection and I can't think of many breeders that would be that dedicated to do so. All in all we have nothing but incredible things to say about Trisha and what she does for this beautiful breed. We are forever grateful for her as well as to be a part of this unique community of Duck Toller owners. We could not be happier with our Daintree puppy, Fin (formerly Grover), who has been with us for almost a month now. Trisha puts a lot of effort into selecting families and getting families and puppies ready for their new homes. We felt very well informed and prepared. Fin had some anxiety when we first met him and Trisha stayed in contact and went above and beyond in helping us address it. You can tell that this comes from a genuine love and concern for each and every Daintree puppy. We are very grateful and highly recommend her! We looked into getting a Toller in November and we were fortunate enough to have a male pup available for pick up, one month later (talk about good timing). Benji is the perfect fit for our family. He gets along so well with other dogs. He has been raised so well with the Puppy Culture theory and therefore house training him was easier than expected. Benji is now 14 weeks old, and after a trip to the vet today for his first check-up, he was deemed healthy! Trisha has made this experience a lot more enjoyable, from her daily photo and video updates, always being available via email and phone calls for any questions, and to providing tons of educational, helpful information. I could go on, and on, about how great Benji is and how great our experience has been. I definitely reccomend Daintree Kennels to anyone looking for a Toller! Duck tolling retrievers are a unique breed, and with Trisha's guidance, they grow up to be amazing companions! This is Starfox who now lives near Boston with his mom and dad who flew up to Vancouver from MA in January 2015 to meet him and bring him home. "We researched Tollers for over a year before choosing Daintree. It was impressive to see that Trisha was just as selective in placing her pups with families. She cares about giving every one of her dogs the best quality of life they can possibly get. Thank you Trisha!" I have the utmost respect for Trisha and would happily get another dog from her down the road. We came to know Trisha after researching the Nova Scotia Duck Tolling Retriever breed. We were very fortunate to receive Cadi from her. Cadi was the last puppy from the Space and Heavens litter. Cadi came with some basic training, which made it easier for us when we transitioned her to our home in Alberta. I know that Trisha takes the time with each puppy before they’re sent to their new home. She will work with them and get them started on training – sit, down, pee pee, etc as well she does her best to get each puppy socialized. I know that when Cadi was under Trisha’s care, she had Cadi socialized amongst adults and children. Cadi is amazing with people and it truly shows the amount of time and effort Trisha put into her. I’m hoping that once things settle down for us with respect to growing our family, I can get Cadi into the Therapy Dog program. I know that when that time comes, I will have Trisha’s support and knowledge to help us through that process. 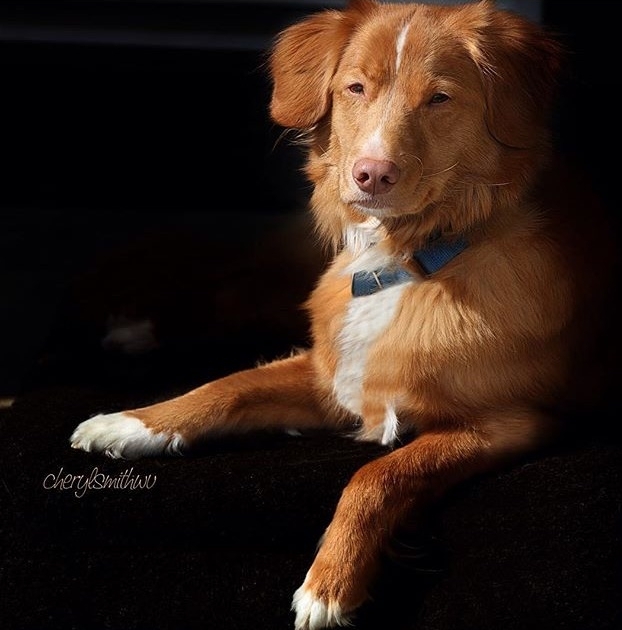 If there is ever a time we have had a question or concern with Cadi (or even our other Toller who is from another breeder), Trisha has always happily answered our questions with no hesitation. When you get a dog from Trisha, you develop a relationship with Trisha as well as other Daintree families, which is really wonderful to see. I know other breeders may not go to that extent. It’s obvious that she loves what she does and it certainly shows through the dogs she takes into her care. In the five years I’ve known her, I have never seen her judge someone’s situation or the circumstances they were in, which I really appreciate seeing from a breeder. If someone had to give up their dog for whatever reason it was, she was there to take it back. I have the utmost respect for Trisha and would happily get another Toller from her down the road. Qantas- Do I recommend Daintree Kennels? Absolutely. I have a Daintree Duck Toller and proud of it. His name is Qantas - (Charlie x Bhindi). Qantas had a shaky start to life which did not go unnoticed by Trisha. When she recognized he was in distress, she took him back from his first owners when he was 9 months old and rehomed him with my family. 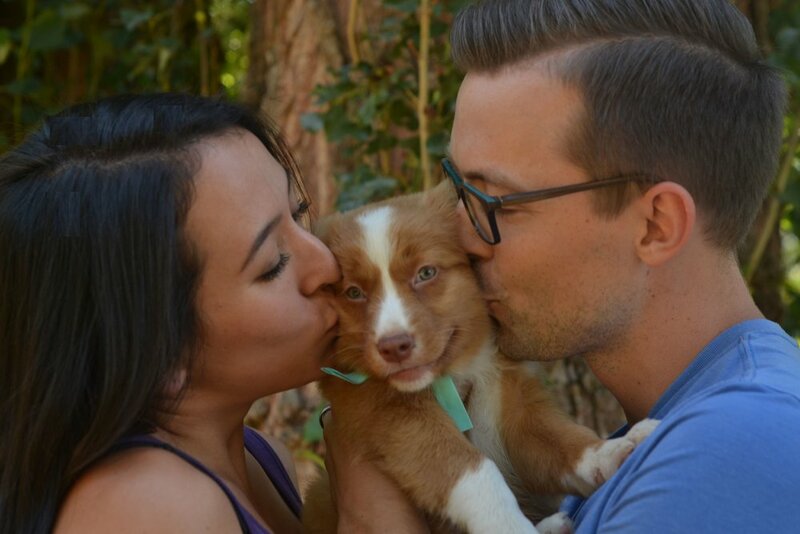 We had lost a Toller six months prior and decided that nothing would do but to introduce another Toller into our home. Qantas arrived with some anxieties due to his treatment at his first home but having some previous Toller experience we were able to quickly convince him we could be trusted and within no time, he developed the fun-loving, zany personality of a typical Toller. Because we had already applied for a Toller puppy from a different kennel where we got our first Toller from, within three months of Qantas's arrival, we added a Toller puppy to the mix - Qantas had absolutely no problems with the pup and the two of them bonded and became unbelievably great friends and still are to this day, nearly 4 years later. Any questions I asked Trisha were answered immediately and her interest in Qantas and his well being has never waned. She posts "Happy Birthdays" to all her pups, asks for photos of them all and proudly posts them. Do I recommend Daintree Kennels? Absolutely. We consider ourselves extremely lucky to have a puppy from Daintree Kennels. The entire process from when we first contacted Daintree to the day we picked up our puppy was an educational, positive and enriching experience. The significant amount of time Daintree puts into training and socializing their dogs is very apparent. All of our friends and family are amazed at his behavior and at how well he has adapted to our home after only 1 week. The resources Daintree provides in preparation for, and after we brought our puppy home is over the top. 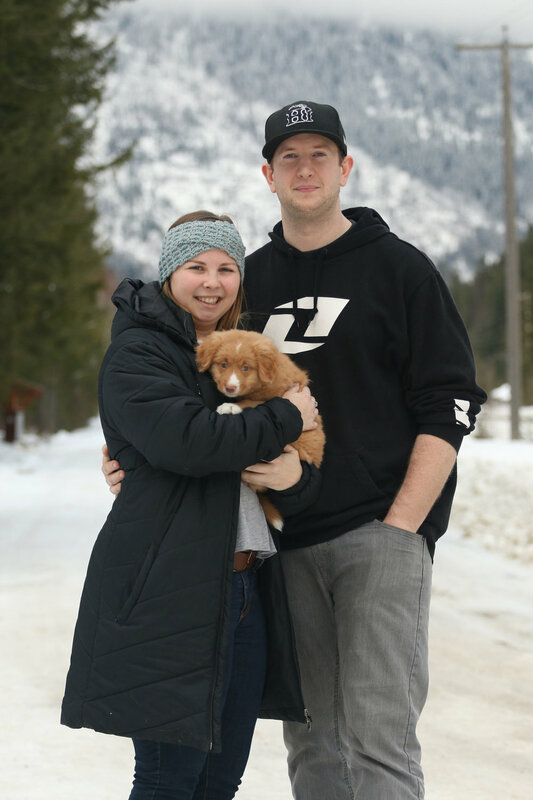 We feel confident and comfortable raising our first Toller puppy knowing we always have Daintree and the Daintree community to help us with any questions regarding training, raw feeding, socialization etc. We strongly recommend Daintree Kennels to anyone looking for a Duck Toller puppy. Jeremy and wife Austin with baby Gunnar. We had a most wonderful experience with Trisha! Our son Blake has wanted a puppy for a very longtime, and he looked for a long time before finding Daintree:). Trisha did her due diligence in making sure his parents were aware of the puppy hunt! The extra care and attention she pays to each and every puppy is truly amazing, our puppy has so quickly become another one of our family:). we would not hesitate to recommend Trisha to anyone. Melisa and Jason with Blake, Hannah and baby Charlie. Wish I could give Daintree Duck Tollers more than a 5/5 rating. The amount of time Trisha puts into her puppies is second to none and it truly shows. From early on they are socialized, trained and loved more than any other breeder I’ve seen. I got my 6yr old Toller from a different breeder and didn’t get anywhere near the support and resources that I received from Daintree. Once I was accepted for a puppy Trisha made herself available with any questions, provided us with daily videos/pics of the puppies and set up a private community so we can stay in touch with with all the puppies from the litter and the families lucky enough to take them home. These pups are amazing and I would recommend Daintree without hesitation. We’re constantly receiving comments from friends and strangers alike regarding how well socialized our pup already is. Now it’s our turn to keep that socialization and training going. Thanks Daintree for an amazing experience and the most wonderful puppy I could ever imagine! You can tell he has been socialized and is eager to learn. Once we decided on getting a Duck Toller Trisha stood out to us as a breeder because of her genuine and sincere rapport, as well as the wealth of information that she provided. It is clear that her heart is fully committed to these dogs! She was always thorough and prompt with her communication and has answered many questions throughout the entire process. We really appreciated the puppy updates that we got along the way and how we got to watch them all grow. We recently got our Spud (Renard from the French Litter) and are overjoyed with how well-adjusted and awesome he is. You can tell he has been socialized and is eager to learn. He was a great traveller on the way home, sleeps nicely in his crate at night, and already knows "sit"! Thank you, Trisha! We couldn't be happier! Trisha not only produces amazing puppies, but she is a great resource after you bring your dog home. We had an amazing experience adopting a puppy from Daintree. Getting a Toller from Trisha is not just adopting a dog; you also become a member of the Daintree family. The support is great and we couldn't be happier with our puppy. We highly recommend Daintree to anyone intrested in a Super-Toller. Daintree puts the dogs first, when it comes time for another pup, it will be a Daintree. After having two Tollers in our extended family we knew this was the right dog for us. The next hardest question was where to get our new family member. After interviewing and being interviewed we knew Trish and Daintree was right for us. We believe beyond a shadow of a doubt that Daintree puts the dogs first. At every turn and every question we have had great support. We have a holistic vet and a fantastic dog trainer and both have complimented what a well bred and well adjusted dog we have. Further to that, the protocols and expectations for feeding, vaccines and raising have been a blessing! We love our dog so much and when it comes time for another pup Daintree will be who we call. We are so happy to have a Toller from Daintree! This is an excerpt from an email I received today. The writer and his partner have just been selected for the Daintree waitlist and are in the "baby puppy preparation phase" before they will welcome a wee Daintree ginger into their homes later this year. As is customary with Daintree, after approval I had sent them a copy of the shopping list, our puppy manual and link to Puppy Culture, a video series I recommend for all new owners. "Thank you for all the information... it is so enlightening and we are learning a lot. It is helping us to get ready at home for her arrival. We are really getting more excited every day as we talk with everybody about her... Thank you again for your thoughtful job and for opening our minds." Because when people choose this kennel in the middle of nowhere with several months' wait for a puppy, there is a reason. They become family and are treated like VIPs. I will drop everything for a call or email from one of my buyers, even years into the future. This kennel is truly, 100% committed to the welfare and quality of life for EVERY puppy ever produced. As an ethical breeder, that is my legacy. My boyfriend and I began looking for a dog over a year and a half ago, looking for the perfect hunting companion. We were curious about what breeds (other than a springer,) would suit our needs and found the Toller, which neither of us had heard about before. We continued researching and decided it was time to find a breeder. We couldn't be more happy that Daintree (and Trisha) was the breeder we found. The entire process was amazing, she kept everyone up to date with pictures and information and she was a fountain of knowledge. We felt comfortable asking her questions (no matter how silly they were) which she would respond to in a fast manner. We got a puppy from the Splash Litter (Denim x Tiffany,) Daintree's Jacques Cousteau and there is not enough praise we can give Trisha. This dog is the perfect companion in every way. He has gone back to his Toller roots as a hunting dog, and as a young puppy he has already demonstrated tracking in the field. He is learning to retrieve. He is well tempered and a dream. JC, aka Daintree's Jacques Cousteau at 3 months and 5 months after tracking in the field. Photo courtesy of owner. Trisha works with all the young puppies, socializing them, and you can tell that he was brought up with love and care. The stepping stones she started with him helped make an easy transition from breeder to owner, and he is an absolute delight. I highly recommend that anyone looking for a Toller (seriously looking,) fills out the application for Trisha. You will be thankful you did. In the future after JC is older and we are ready for another Toller puppy we know that Daintree is where we will go because Trisha gets it right. Daintree dog owners become family with one another, and it is the greatest thing to experience. - HK Woods, JC's "Mom"
JC and his new owner, "Dad", Andy, on pickup day.